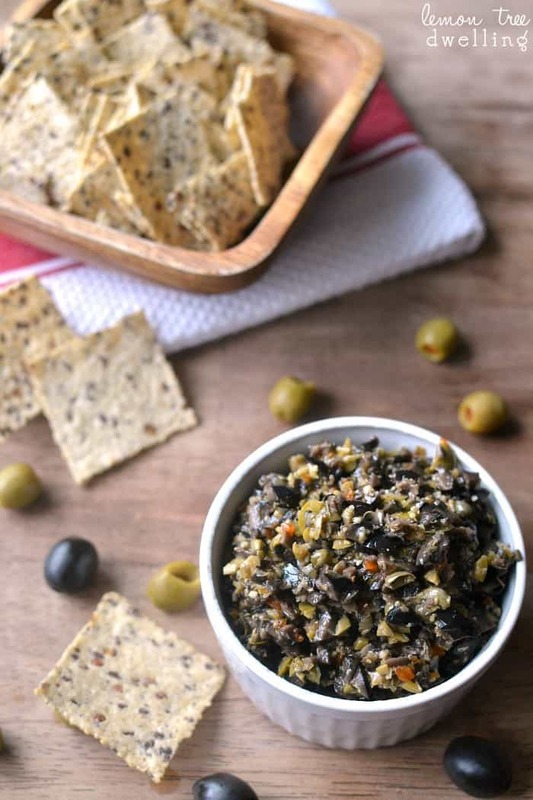 Olive Tapenade made with black and green olives is packed with flavor and perfect for dipping! 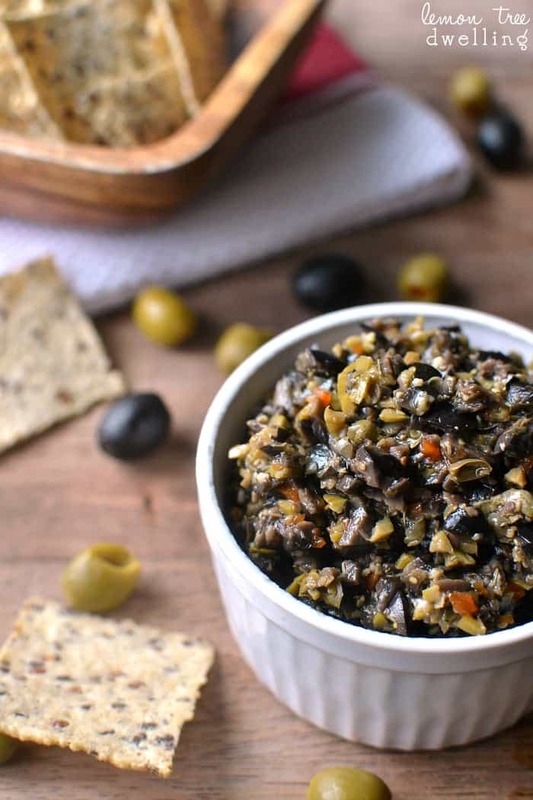 This easy recipe comes together in minutes and is the BEST olive tapenade ever! I’d be lying if I said everyone is on board with this plan. The girls are still hoping to make and decorate cut-out cookies (I’m not so sure about that plan) and they have been watching in despair as I give away so many of the treats we’ve already made. As if I’ll never make a treat again…..! No, I just need a little break. After all, there’s more to life than treats! There are also snacks…..and those are super important, too. One of my favorite ways to snack? Tortilla chips and dip. There’s just something that’s so satisfying about piling your chip high with dip….and believe me, I pile it high! 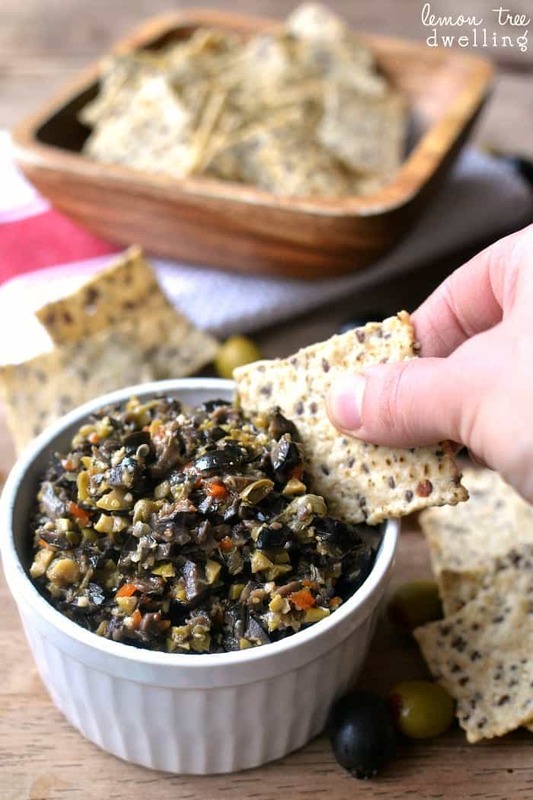 And one of my favorite kind of dips is this deliciously simple Olive Tapenade. I love it because it’s quick, easy, healthy, and full of flavor. But it feels fancy! So it’s a great way to treat yourself AND a perfect snack to bring to a holiday party! It is delicious on nearly anything – chips, crackers, bread, by the spoonful…….and no one will ever guess that it took you five minutes in the food processor. Score. And….since New Year’s is just around the corner, and I’m sure you’ll be making some resolutions soon…..do you see those chips in the photos? They’re my new favorites, because not only are they delicious, but they’re sprouted! And they’re non-GMO. 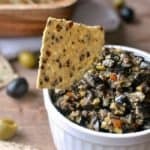 And they taste amazing with this olive tapenade. 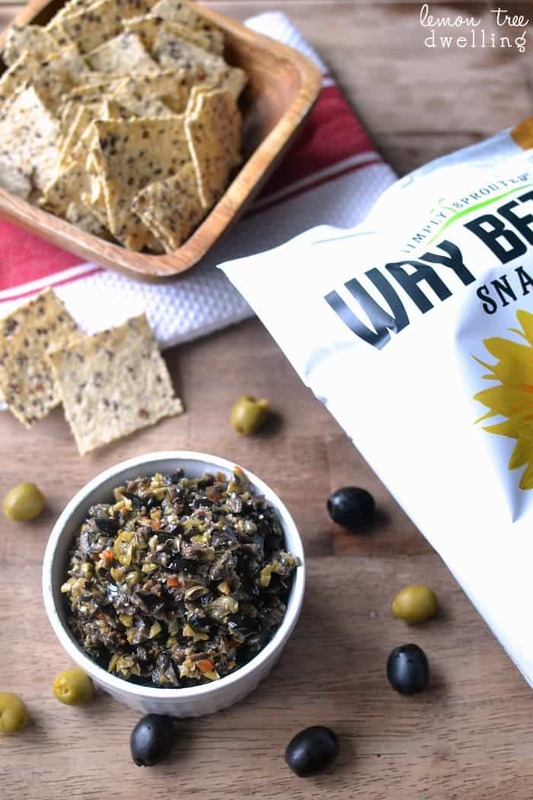 They’re from a company called Way Better Snacks….and they totally fit with your New Year’s resolutions. Just sayin’. Combine black and green olives in a food processor and process until coarsely chopped. Remove to a bowl. Combine olive oil, garlic cloves, capers, mustard, and seasonings in a food processor and process until garlic and capers are minced. Pour olive oil mixture over olives and stir until combined. Another great dip to try is my Bacon Blue Cheese Dip. Great for any occasion and quick to put together. This looks amazing, my kind of appetizer! I agree with you, it’s time to get the suites over to offices, schools and neighbors! I’m not a fan of having too much sugar around our house! This on the other hand, would be wonderful on the counter to enjoy Christmas Eve! Enjoy this last weekend before Christmas! My sister did appetizers and drinks at her house on Saturday night and she totally made an olive tapenade that was amazing! Instead of asking for her recipe I’ll just use yours. It looks awesome!! Made this last night for my book club. DELICIOUS! Best tapenade I’ve ever had. Could not stop eating it! I am making this today sounds simple and delish! I am giving it a 4 just because of the ingredients. Enjoyed the story also! I have made this a couple of times and I serve with a soft goat cheese spread. Absolutely delicious! Some have said it’s the best tapenade they have ever had. Easy too! I made this today. I thought it would be a great snack for my breaks at work. It turned out great! I didn’t have any capers though so I substituted with dill pickles and doubled the thyme. Next time I’ll have to try it with capers. 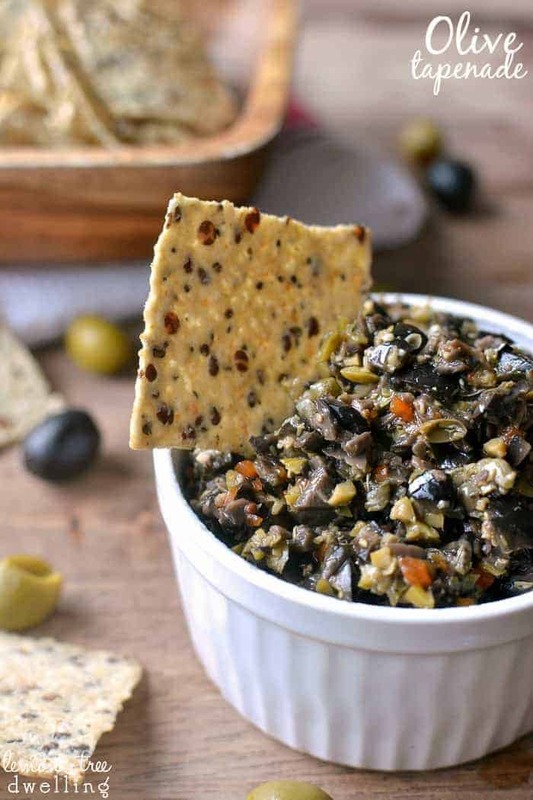 Tried this recipe on a whim because I had taste for olive tapenade. The whole family went crazy for it! So much flavor! Will be putting this into my appetizer rotation. Thanks! !